The main difference between system software and application software is that the system software helps to run the computer hardware and application software while the application software helps to achieve a specific user requirement. Examples of system software are operating systems, languages processors, and device drivers while a few examples of application software are word processor, Spreadsheet, Presentation software, and web browsers. Computers consist of hardware and software. The software is further divided into system software and application software. System software is essential for the proper functioning of the system. It is designed to run hardware and application software. It also manages the resources of the system. On the other hand, application software works to achieve a particular user requirement. Therefore, system software is general-purpose while application software is specific-purpose. System software is the software required to run hardware and application software. It is an interface between the user program and hardware. It converts the human-readable instructions into machine understandable instructions. There are various types of system software. Operating systems, languages processors and device drivers are few examples for system software. An operating system is system software that handles the functioning of the hardware to carry on their tasks successfully. Memory management, file handling, resource management and scheduling are some tasks of an operating system. Furthermore, language processors such as assemblers, compilers and interpreters convert the high-level programs or assembly language to machine language. Device drivers will control and monitor the functionalities of specific devices such as printers. These are some common examples of system software. Application software cannot function without system software. It is designed to accomplish a specific task such as managing documents, handling calculations, editing images, etc. They are written in programming languages such as C, C++, Java, Visual Basic, etc. There are various types of application software. 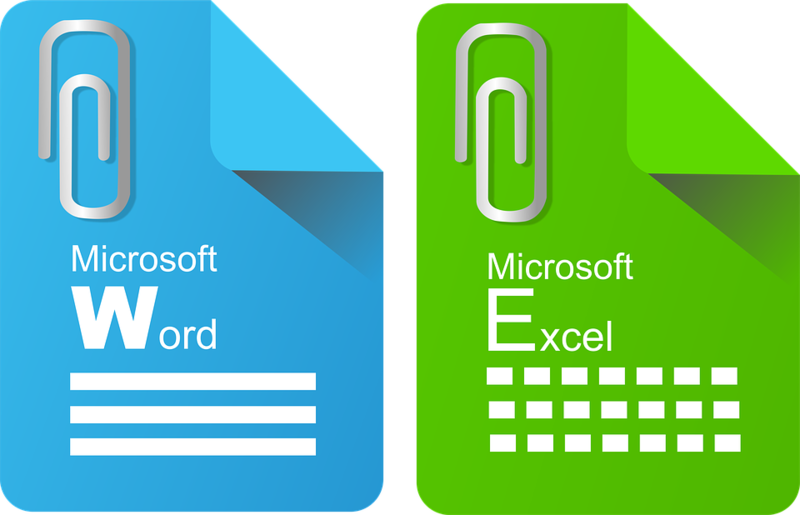 Word processors allow the user to create documents, reports and other documents. It provides formatting features and spelling and grammar checking. Moreover, presentation software allows the users to create presentations. Spreadsheets allow the users to prepare financial documents, create graphs and charts. It also provides formulas to perform complex calculations easily. Meanwhile, database software helps to store and manage a collection of data. Business organizations, educational institutes and even worldwide popular websites such as Amazon use database software to store and manage data. These are few examples of application software. 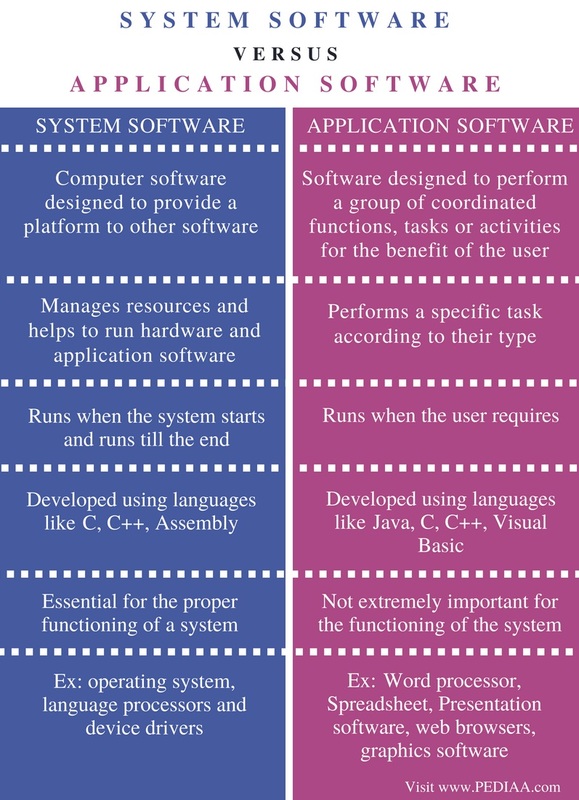 System software is computer software designed to provide a platform to other software. Application software is a software designed to perform a group of coordinated functions, tasks or activities for the benefit of the user. System software manages resources and helps to run hardware and application software. On the other hand, application software performs a specific task according to their type. System software runs when the system starts and runs till the end. The application software runs when the user requires. C, C++, Assembly are some languages to develop system software. Java, C, C++, Visual Basic are some languages used to develop application software. System software is essential for the proper functioning of a system. Application software is not extremely important for the functioning of the system. Therefore, the system can work without application software. Operating system, language processors and device drivers are some examples of system software. Word processor, Spreadsheet, Presentation software, web browsers, graphics software, database software, accounting software are some examples of application software. 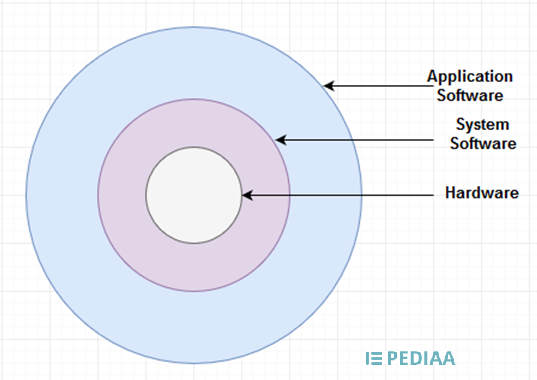 The difference between system software and application software is that system software helps to run computer hardware and application software while application software helps to achieve a specific user requirement. System software is essential for the system to work properly but the system can work without application programs. 1. System Software, Tutorials Point (India) Pvt. Ltd., 17 Jan. 2018, Available here. 2. Application Software, ITGSFrau, 27 Jan. 2013, Available here.